I looked up Shannon Souza’s website, www.electshannonsouza.org, to check up on why Dallas Heard refuses to face her and debate any issues of the state senate race with her. Shannon Souza is a live wire with an impressive resume. If I was Dallas Heard, I would hide from her, too. He is smart to avoid giving the public a chance to compare him to Ms. Souza, because she would eat him alive. She has a long history of successful activism in the Coos Bay area, is an accomplished mechanical engineer running her own company and the bass player in a hot band to boot. If the voters had a chance to compare the two, even the hard-guy right wing Republicans would have to admit she would make a much more effective state senator than a neophyte appointed to a position way beyond his skills. The losers here are the good people of this state who deserve a chance to compare the two and vote for a senator who will stand up for the issues of Southern Oregon. How can the voters of any party believe that Dallas Heard will stand up for us when he will not stand up for himself? If he is scared of Shannon Souza now, how can you figure he will face the Democratic majority in the state senate? Wednesday's paper clarified my confusion. We read earlier that Shannon Souza would not be speaking at the League of Women Voters forum. I was perplexed. But the article in Wednesday's paper explained that the policy of the League does not allow only one side to be heard. This is unfortunate, as Shannon has a lot to say. It's also unfortunate that interim Sen. Heard is not accepting the League's invitation to speak here in Roseburg, nor in Coos or Curry Counties. I don't doubt it is due to the fact that he's afraid to face off with such a well-spoken, intelligent woman. Yes, he says his dance card was full, but I suspect he can't keep up with the music. If you are curious, it is easy to see what she might have said if you visit her website, www.electShannonSouza.org, or view the comments she made at the Curry County forum on YouTube. She has many cogent and appropriate suggestions for our district and knows how to get things done. Please take the time to inform yourself, and vote. Shannon Souza will be allowed a seat at a Tuesday candidate forum after all. The League of Women Voters of Umpqua Valley announced Friday it was reversing an earlier decision to not seat Souza. The original decision was made because her opponent, Interim Sen. Dallas Heard, R-Winston, had declined the invitation. Souza is the Democratic nominee for Senate District 1. She had previously been told she could not attend, based on longstanding League rules against having an “empty chair” debate, in which only one candidate is present. News-Review file photo- Democratic nominee for Senate District 1 Shannon Souza speaks to precinct committee members at a convention in Bandon on Saturday. In one of the most conservative areas of Oregon, Souza will face incumbent Republican Dallas Heard in the general election on Nov. 6. Oregon state senatorial candidate for District 1, Shannon Souza, and her band Che's Lounge, will perform at 7 p.m. Friday, June 29, at the 7 Devil's Brewing Co. Garden, also a release party for 7 Devils' wheat ale, Hydrant, in support of the Coos Bay and North Bend professional firefighters and the Jeff Common Memorial Foundation. 7 Devils will be donating a portion of every Hydrant sale to the cause. Photo by Darren Sherley- SherShot Photography. State Senate candidate Shannon Souza is hosting Drinking Civilly at 4 p.m. Sunday, Aug. 26, at TJ’s Pub & Grill on U.S. Highway 101 in Port Orford. Drinking Civilly has become a routine meet-and-greet once a month in Coos County. Souza co-founded it to bridge the political divide. This will be the first time Drinking Civilly comes to Port Orford. “I paddled from my dock on the Millicoma River upstream, past the old closed down tavern to the grove of majestic black lotus trees. It is my favorite spot along this section of the river where I’ve drifted under their drooping June bouquets of blossoms with my, then, toddler sons, the air full of fragrance or come upon the rustling wind’s ticker parade of spent golden leaves fluttering across the valley to blanket the river. Today, though, I am alone daydreaming. 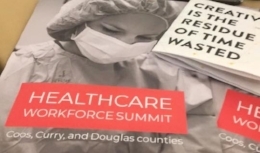 Thank you Healthcare Workforce Summit coordinator Skaidra Scholey and Southwestern Oregon Workforce Investment Board for an excellent program kicked off by a keynote address reminding us that, “Creativity is the residue of time wasted.” – Albert Einstein – And thank you Angela Espersen, Associate Creative Director of Fiction Strategy and Design Studio for reaffirming my practice of the daily daydream which, for me, typically occurs on a trail run, paddle, bike ride, back pack or surf. What a wonderful place we live in where we have access to such preciously beautiful opportunities to day dream in this way. Today I’m daydreaming about what my other take home messages from the event were and how they reflect and connect with similar forums I’ve attended in our region on housing, economy, education, resiliency, business and natural resource management. The common message is Adapt or Die. Our technology, environment, economy and societies are changing faster than ever recorded. We cannot continue to operate under the old playbook – we have got to radically rethink our systems. Thankfully, the other common denominator of these gatherings is a room full of Informed, Engaged and Connected individuals and organizations quite capable of the task of Adapting – provided we all work together. Since I know that we are people of the frontier, familiar with the notion that No One is Coming to Save Us so we better take care of ourselves, I remain optimistic. To paraphrase Annette Shelton-Tiderman – our Regional Economist from Oregon Employment Department, in order to support a healthy regional economy we have got to attract and retain working families. As Asst. Dean for Rural Medical Education, OHSU School of Medicine Dr. Paul Gorman observed – financial incentives are not enough. Working families want successful schools for their children, a diverse economy for fulfilling employment, clean air and water, positive community engagement, affordable housing and integrated community health resources. Once we figure that out the drop dead natural beauty of the place will take care of the rest. Since I’m an experienced daydreamer I wonder, “What percentage of our international military budget would it take to redeploy our military personnel and government contracts to achieving those goals?” I’ll table that musing, for the time being. o Focus our Investment “upstream” to our children’s mental health, educational excellence and direct career pathway opportunities. Healthy, capable and responsible citizens (potential employees) are good for business, rely less on social support systems and contribute to the local economy. I have heard that $1 spent on Head-Start alleviates $27 spent on other social services down the road. I’d like to hear more. o Foster private investment from the business community directly into the education of local residents more likely to stay where their roots are. Considering the expense of attracting, training and unsuccessfully retaining transplants or hiring costly travelers (transient workforce – 80% of whom do not live in Oregon so do not contribute to our tax revenues), this may present a nice Return On Investment for our local employers. · Support our public educational institutions in sustainably expanding programs to connect willing and able applicants with quality, marketable certifications. o Both Jason Aase – Dean of CTE at Umpqua Community College and Francisco Saldivar – Dean of Instruction at Southwestern Oregon Community College reported that their respective nursing programs run at a deficit. This is a sure sign of a broken system. Let’s put our heads together and pencil this out. More rural nursing graduates = more accessible health care = reduced turn over/overhead = more grow your own + attract and retain = higher local and state tax revenues. Hmmmm, seems like we need some collaborative stepping up to the plate on this one for mutual benefit to the private and public sectors, no? I was recently appointed by the Professional Engineers of Oregon Board President as a Member of the Board of Directors representing Oregon professional engineers in private practice. I am proud to fulfill this roll and serve with Engineering Professionals Committed to a Code of Conduct, Ethics, Professionalism, a Standard of Technical Excellence and Public Safety. At that same Professional Engineers of Oregon (PEO) conference (at the beautiful, coastally iconic Salishan Resort) I bumped into my long time colleague Senator Arnie Roblan – our key note speaker. From his address I noted that Arnie shares my fascination with mathematical theory and the appreciation of the perspective of the engineer’s mind in approaching problem solving at the societal level. Senator Roblan has blazed a non-partisan problem solving approach at our state legislative level with his Coastal Caucus – an effective use of the Venn Diagram concept that enables coastal legislators to identify their common ground and leverage each other’s strengths to implement meaningful legislation to improve the business and living conditions of the Oregon Coast. I want to be on that Caucus. My 23 years of coastal Oregon experience have equipped me with the skills, perspective and understanding of the needs and opportunities of our coastal communities required for contributions to this model of legislative collaboration. I also enjoyed comparing notes with Tom Roberts, the president of the National Society of Professional Engineers. We discovered our common grounds of the value of industry and manufacturing in the U.S.A. and an affinity for the lessons of Steven Covey in planning the work and working the plan. Tom and I are also both Precinct Committee Persons – though he serves the Republican party of Kansas and I the Democratic party of Oregon – with a common understanding and experience that it is of upmost importance that we all engage in our democracy, look beyond party rhetoric to the real issues and opportunities facing us and put our heads together for Win Win solutions. This was all icing on the cake for the fabulous crew of our Oregon Professional Engineers in residence for the event. These are the people designing our infrastructure for communication, transportation, dwelling, conducting commerce, water and electricity supply, waste management, forestry, agriculture, education and emergency response. I couldn’t help but look around and ask “Is there Anything this group could not accomplish?”. I think not. We just have to bust out that Venn Diagram and pull in the same direction.